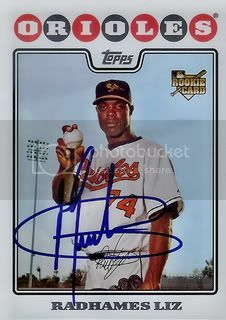 Radhames Liz was acquired by the San Diego Padres from the Baltimore Orioles around the end of November. This was good news for us since he has an 08 Topps card. Yorvit Torrealba is one of the new additions to the San Diego Padres roster this year. He joins the Friars after four seasons with the Colorado Rockies. 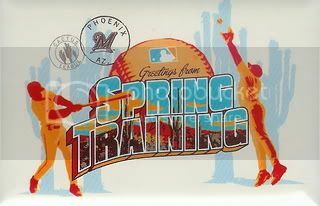 This is the last week of Spring Training and I still have plenty more 08 Topps cards to post about. 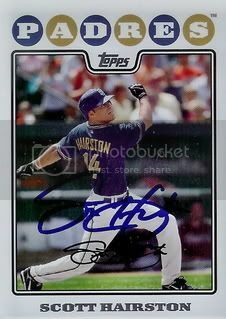 Next up is San Diego Padres outfielder, Scott Hairston. Scott in returning to the Padres after finishing the 2009 season in Oakland. This time he is being joined by his big brother, Jerry. We were able to get both of the Hairston brothers autographs the other day. 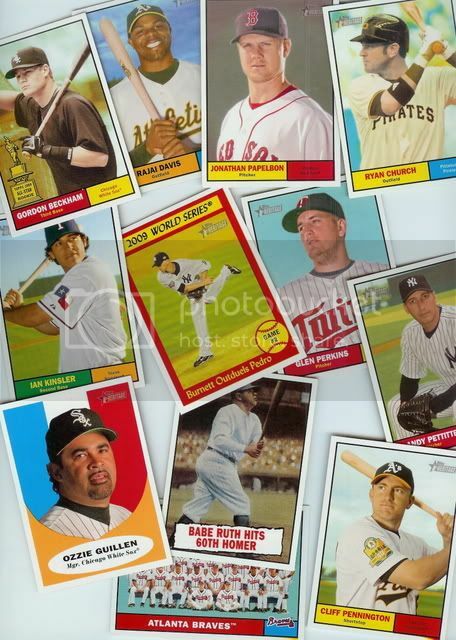 Unfortunately, Jerry doesn't have a card in the 08 Topps set. 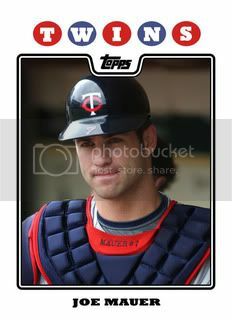 Why Joe Mauer? He was the 2009 American League MVP! Minnesota Twins fans got great news last weekend. Joe Mauer will be the centerpiece of the Twins lineup until 2018. Joe has made some major accomplishments since his MLB debut in 2004. Joe is already a 3x All-Star, a 3x batting champ, a 2x Gold Glove Award winner, and oh yah... he has that MVP award too. Most impressive. # 588 - Tony Gwynn Jr. The son of Mr. Padre seems to have found his own place in San Diego. 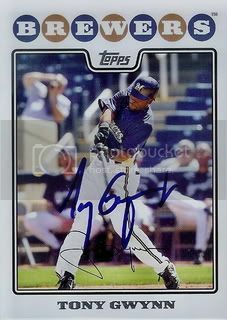 Tony Gwynn, Jr. was traded to the orgainzation that his father spent his entire career with on May 21, 2009. Entering 2010, Tony Jr will be expected to hold down centerfield as an everyday outfielder at Petco Park. The San Diego Padres have gone through a lot of roster moves since 2008. 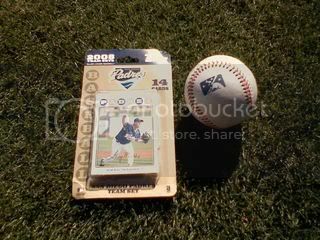 They don't have many players still around who were wearing a Padres uniform when the 08 Topps set came out. However, their manager hasn't changed. 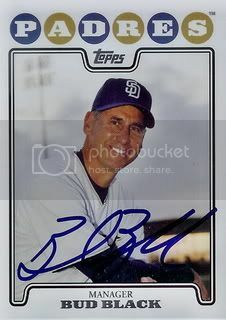 After a 15-year MLB career, Bud Black is entering his fourth season as manager of the Padres. Little known fact: Bud Black was a member of the 1985 World Champion Kansas City Royals. 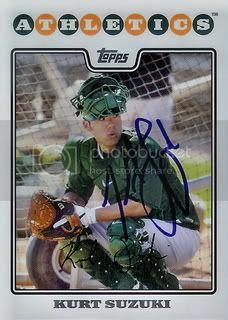 Hernan Iribarren began Spring Training 2010 in Maryvale with the Milwaukee Brewers and he will be finishing it in Surprise as a member of the Texas Rangers. He was claimed off waivers by the Rangers on March 13th. 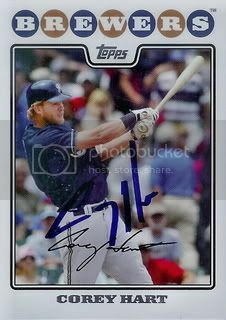 Regardless of which team he plays for, Hernan has a nice signature that shows up great on his 08 Topps card. 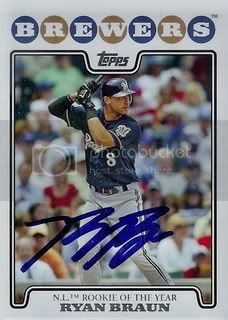 Jim Edmonds is another current Milwaukee Brewers player who has two cards in the 08 Topps set. 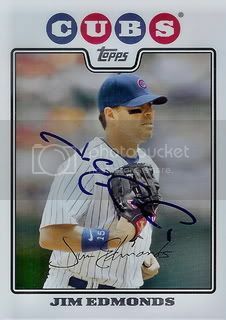 We were able to get him to sign his Chicago Cubs card from the Updates & Highlights set the other day. Over the past two decades, Jim has been one of the most exciting players to watch. We are very glad to have this card in our collection. 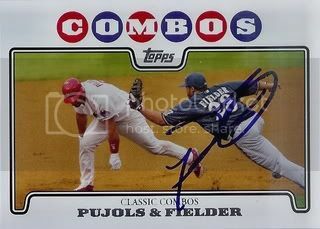 Card # 536 from the 08 Topps set features two of the best power hitters in the National League: Prince Fielder & Albert Pujols. Corey Hart day continues with Corey's All-Star card from the Updates & Highlights set. Another nice addition for our 08 Topps set. Thanks, Corey! Hey hey! It's Corey Hart day! 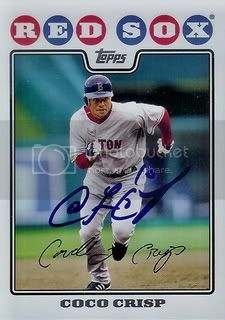 Corey has two cards in the 08 Topps set. When we went and saw the Brewers the other day, he signed them both for us! Thanks, Corey! Why Neftali Feliz? Dude's gonna be good! 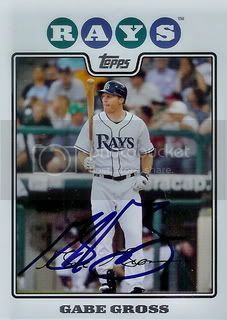 The scan is a little dark but this is the second custom card we've made and been able to get autographed. 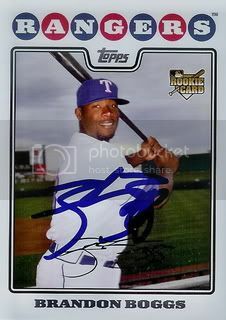 Neftali Feliz signed this for us last week before a Spring Training game. 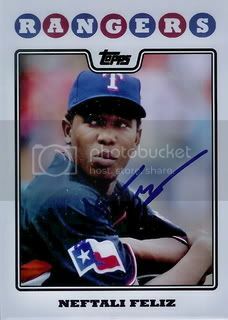 The Rangers are still trying to decide if Neftali will be starting or coming out of the bullpen. Either way I'm sure he will dominate. We're really glad to add this card to our collection. Thanks, Neftali! When we decided to try and get some Milwaukee Brewers autographs the other day, we were hoping to be able to add Prince Fielder to our 08 Topps collection. Lucky for us, Prince was in a great mood and signed a ton of autographs that day. We were very glad to be able to get his card from Series Two of our set signed. Prince is one of the best power hitters in the league. He is a two time All-Star and you may remember he even won the Home Run Derby last year. Thanks, Prince! This is going to be one of my son's favorites! 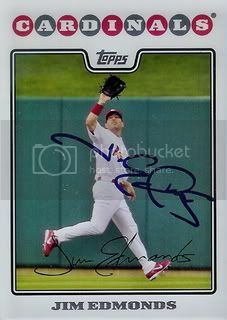 After sitting out all of 2009, Jim Edmonds is back! 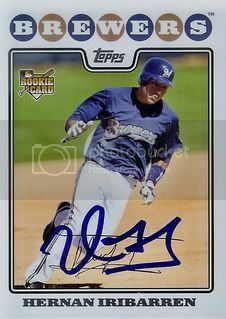 I've heard nothing but good things about his comeback and it seems like he will be holding down centerfield for the Milwaukee Brewers in 2010. Jim is a great guy and a great player. 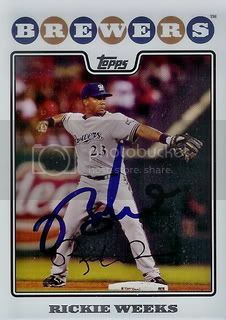 He is a four time All-Star and a eight time Gold Glove winner. We were thrilled to have him sign his 08 Topps card for our set. Thanks, Jim! Glad you're back! It seems like Milwaukee Brewers second baseman, Rickie Weeks has been around forever. The former Golden Spikes Award Winner is still trying to live up to the potential that made him the number 2 pick in the country in 2003. I still like Rickie and hope he has a breakout year in 2010. 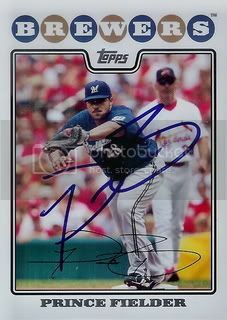 Former Arizona Diamondbacks fan favorite, Doug Davis is back in Brewers camp this spring. He had previously pitched with the Brewers for four seasons before coming to the desert. Little known fact: Doug has established the Doug Davis Foundation to help assist children with various medical, social and family needs. The foundation has done a great deal of work with helping the families of children with autism. It seems like we've been getting autographs from a lot of players who are coming back from injury. 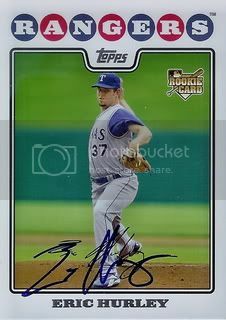 Milwaukee Brewers pitcher, Chris Capuano is another one. An All-Star in 2006, Chris has been rehabbing after Tommy John surgery. 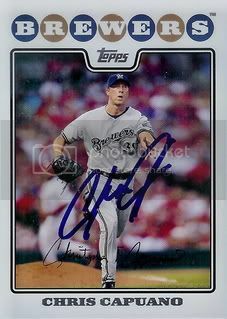 He is looking to make his way back to the Brewers rotation in 2010. We went to see the Brewers a few days ago. 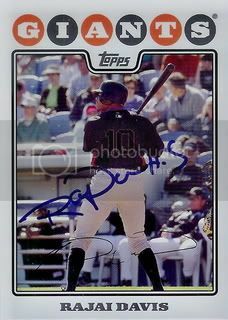 They had a lot of players with 08 Topps cards that we needed to get signed for our set. We didn't get them all but did very well overall. First up is Milwaukee Brewers star outfielder, Ryan Braun. Ryan was Rookie of the Year in 2007. He has been an All-Star twice and he even led the National League in hits in 2009. 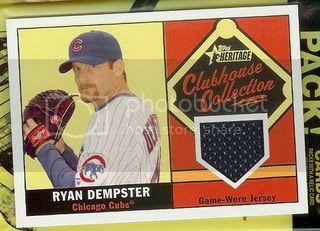 Ryan has four cards in the 08 Topps set. We decided to get started with his Rookie of the Year card from Series One. Another awesome addition to our set. This one is definitely one of our favorites thus far. Why Aroldis Chapman? I have Chapman Fever! 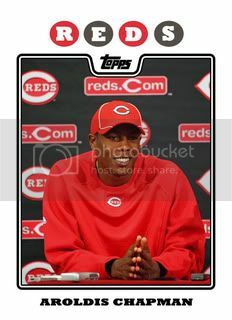 Aroldis is one of the most interesting story lines entering in the 2010 season. Over the summer my Grandma and I watched a report about his defection on ESPN's Outside the Lines. If you're a Cincinnatti Reds fan, this will be a fun season to watch. Picked up a pack of 2010 Topps Opening Day this morning at Target. If you haven't seen these yet, they are exactly like the regular issue Topps cards but with an Opening Day logo in one of the corners. 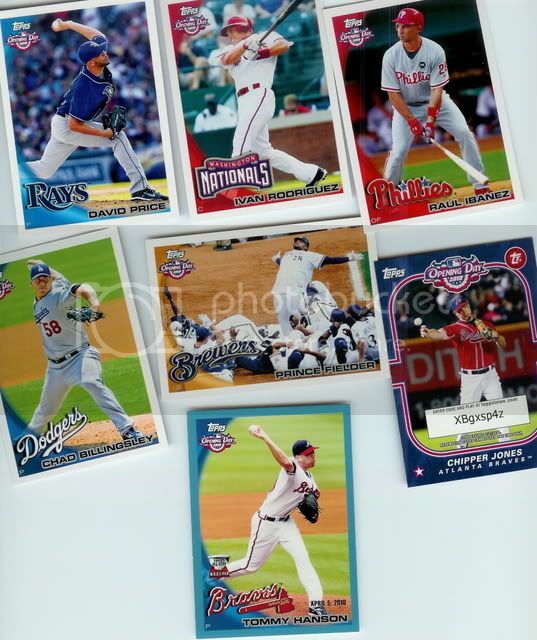 I did pull a parallel card of Braves pitcher, Tommy Hanson and a Chipper Jones Topps Town Stars insert. Feel free to steal the code, I'm not a Topps Town guy. 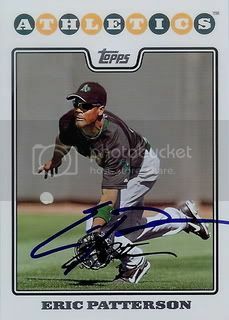 I remember watching Gabe Gross play in the Arizona Fall League back in 2001 and 2002. It was nice to see him again at the Oakland A's practice we went to. Always a great guy. Eric Patterson was an eight round draft pick by the Chicago Cubs, the same team that drafted his brother ( Corey Patterson ). 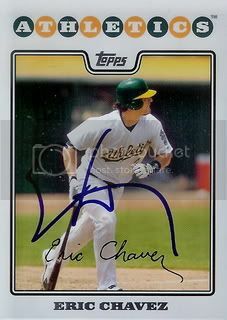 Eric was traded to the A's during the 2008 season in the deal that sent Rich Harden to Chicago. 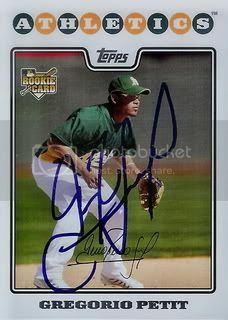 Gregorio Petit is an infielder in the Oakland A's organization. He has been called up twice over the past two seasons and has amassed a total of 25 games played. 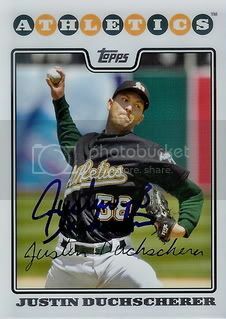 Oakland A's pitcher, Justin Duchscherer had two cards in the 08 Topps Updates & Highlights set. 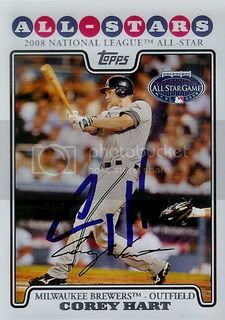 We posted the regular issue this morning but Justin also signed his All-Star card for us. Little known fact: Justin is a two-time All-Star. 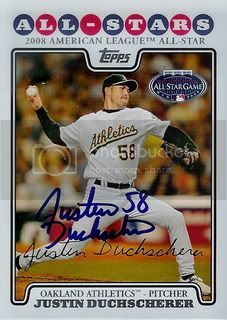 After missing all of the 2009 season, Justin Duchscherer is back and ready to take the mound for the Oakland A's. Justin has always been an extremely nice guy. 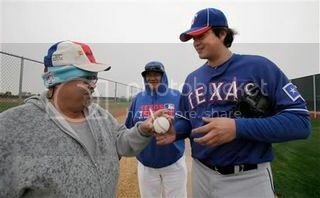 He signed autographs for a good thirty minutes at the practice we went to a few days ago. Thanks, Justin! 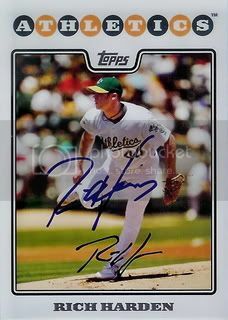 Great autograph on a great card! 2009 was a breakout season for Rajai Davis. The Oakland A's outfielder hit .305 and stole 41 bases. After spending time with the Pirates and Giants, he seems to have found a home in Oakland. Outfielder, Coco Crisp is new to the A's in 2010. He brings eight years of Major League experience and a World Series ring to a youthful Oakland organization. Ryan Sweeney was acquired by the Oakland A's in the trade that sent Nick Swisher to the White Sox. Since then, he has only played in 40 games. The Athletics will be looking to find him more playing time in their outfield during 2010. 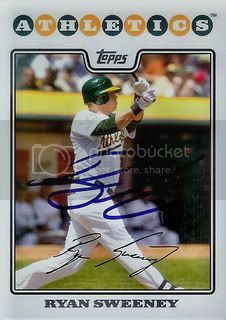 At a Spring Training practice a few days ago Oakland A's starting catcher, Kurt Suzuki, signed a card for our set. Another nice card. Thanks, Kurt! Next up, Mark Ellis. Mark is another veteran who has been playing in Oakland for his entire career. Little known fact: Mark hit for the cycle on June 4, 2007. This week is going to be Oakland A's week up on the blog. We'll be having two posts a day ( one in the morning, one in the afternoon ) all week long. All's A's. All signed 08 Topps cards. Getting everything started with the guy who's been wearing an Athletics uniform longer than any other current player, Eric Chavez. Little known fact: Eric won six consecutive Rawlings Gold Glove Awards ( 2001 - 2006 ). I had to make a trip to my local Target this afternoon and I was hoping they would have the new 2010 Topps Heritage cards. I haven't seen too much in the blogosphere about this set but I had heard that these had been released. They had about six Jumbo Packs on the shelf. The Jumbo Packs are slightly transparent and you can easily tell which card is on the top of the pack for the upper section. I passed up Kendry Morales and went with the second pack I saw. The Babe Ruth 60th Home Run card was visable. Not sure why but I thought maybe the Babe would bring me some luck. He did! I pulled a Ryan Dempster Clubhouse Collection relic card. 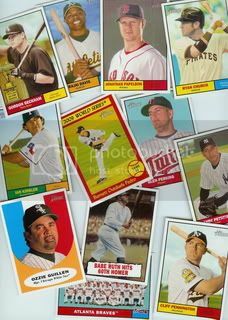 It's rare that I've done a blog post that wasn't related to the 2008 Topps set but it is something I would like to try to start doing more of. 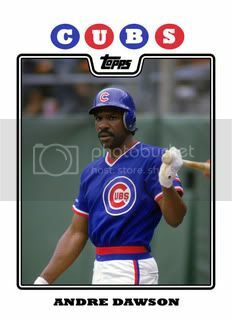 Why Andre Dawson? Growing up I was a HUGE Cubs fan. My two favorite players were Ryne Sandberg and Andre Dawson. I remember spending plenty of summer days watching Cubs games on WGN with my dad. Nothing better than listening to Harry Carey and Steve Stone call a day game from Wrigley Field. 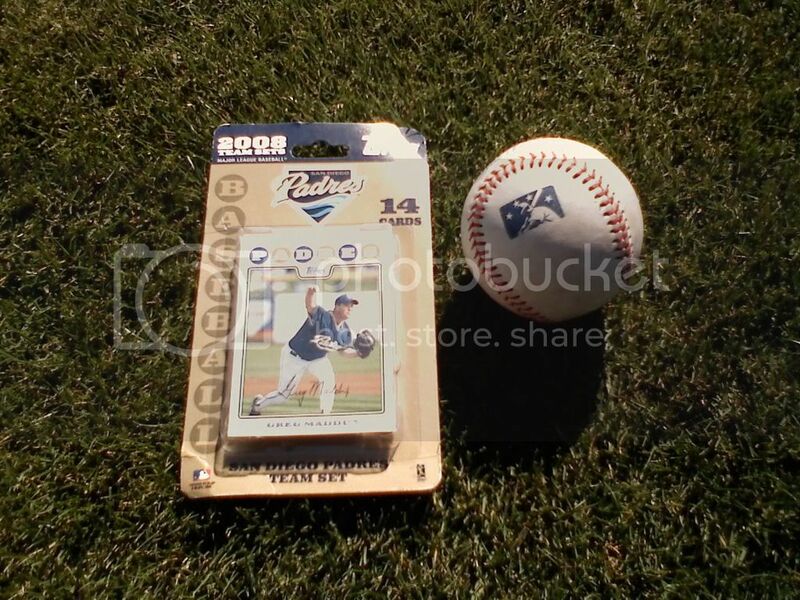 I figured that card number eight for our custom set had to go to the newest member of the Hall of Fame, "The Hawk." My son and I went out to Peoria today to see the Padres for the first time this year. We started off our day over at the practice fields. When we walked in, two of the Peoria Diamond Club volunteers were waiting to greet us and ask if we would like to purchase a scorecard for the low price of one dollar. I hardly every carry cash but I happened to have a few dollars in my wallet so I made the purchase. While the first gentleman was taking my money, the second asked if my son would like some Padres stickers for free. Sure why not? And then he asked if we would like some free baseball cards. Yes, please! I figured it would be some kind of sample pack or something relatively uninteresting but there was no way I was going to turn down free cards. To my surprise he pulled out an 08 Topps Padres team set and handed it to my son. Sweet! How did he know that's our set? A big thank you to the San Diego Padres and the Peoria Diamond Club. This was a great way to start off our day. 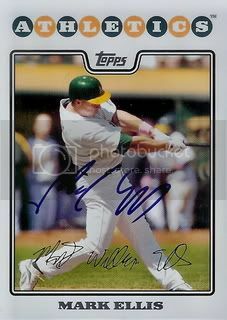 By the time we left, we were able to add six more signed 08 Topps cards to our set as well. In addition to cards we got signed today, I still have some Brewers, Rangers, A's, Dodgers, and Mariners stuff to post about. Starting Monday, I think I'll post about two cards per day instead of one to try to through as much as possible before Opening Day. Thanks to everyone who has been reading and commenting! February was a great month. We had the most posts ever in a single month and will probably top that in March. Also, our checklist on Google Docs was updated yesterday for the first time since it's creation. 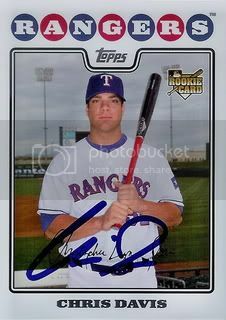 At the second Texas Rangers Spring Training practice we went to last week, we were able to get Rich Harden to sign his card from Series One of the 08 Topps set. Rich is a great guy. Both days we saw him, he spent lots of time after practice signing autographs for all of the fans. Last year, I was able to get off to a good start on our set by getting cards signed by most of the Texas Rangers players. Pitcher Eric Hurley was one guy I didn't have a shot at getting. 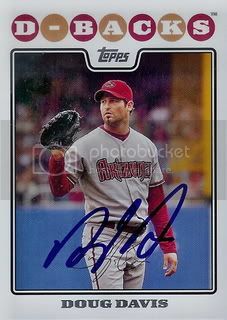 He missed all of 2009 with a torn rotator cuff but is already practicing with the rest of his team in Surprise, Arizona. Brandon Boggs time in the majors can't be described as much more than a cup of coffee. This Spring, he is fighting to land on the Texas Rangers roster as a backup outfielder. 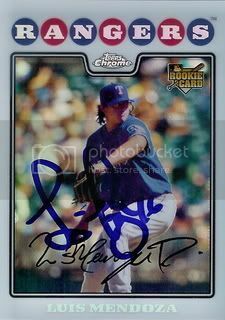 Another great card from an up and coming Texas Rangers star. Chris Davis signed his card from the 08 Topps Updates & Highlights set for us before during a Spring Training practice last week. 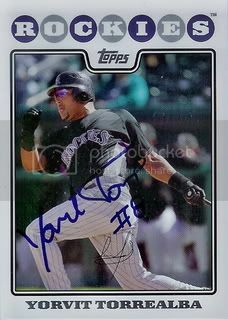 Last March, Luis Mendoza signed his card from the 08 Topps set for us. This year he signed his Refractor from the 08 Topps Chrome set. Little known fact: Last year at Triple A Oklahoma, Luis pitched a no-hitter.